Christmas is my favorite time of the year. All the gift giving and decorating, not to mention the baking and candy making, just really make my year. I’ve learned a few things over the years that have helped me to make the most of the holiday season, more specifically, things about organization. Without being organized I promise you that I would never get anything done. I used to really dread taking down my Christmas decorations just because the whole process seems so disheveled and unorganized. What I’ve learned is that if you tackle everything with a bit of organization, you have a much happier time getting things done. On that note, I have found 12 amazing ways that you can stay organized this holiday season. From putting up the ornaments to tying down your artificial Christmas tree, there is an organization tip in here that is going to make you so happy. And, when you use these tips to put away your Christmas decorations and supplies, you’ll have a much easier time next year when it comes time to get it all out again. Organization is key to a productive and stress-free life and if you really want to get your life organized, be sure to take a look at these 30 mason jar organizers. They’ll help you to keep everything in its place. These are all really easy ways to get yourself organized for the holidays and beyond and you can do them on a budget. None of them are expensive, which is another one of my passions. I just love saving money and when I can save money and organize at the same time, I’m a really happy camper. And if you want even more cheap organization tips, be sure to check out these 12 tips to organize your closet on a budget. If you tend to need some of your holiday decorations sooner than others, create an open first box. Pack up all of those supplies that you want to use first, like things that you may use to decorate for Thanksgiving as well as Christmas. Label the box so that you know it’s your open first box and contains all of those early decorating supplies. This will save you from having to rifle through entire boxes of decorations to find what you need. If you want a really cheap and easy ornament storage solution, look in your fridge. Those egg cartons are perfect. Not only will they fit most Christmas tree ornaments perfectly, they are designed to protect. 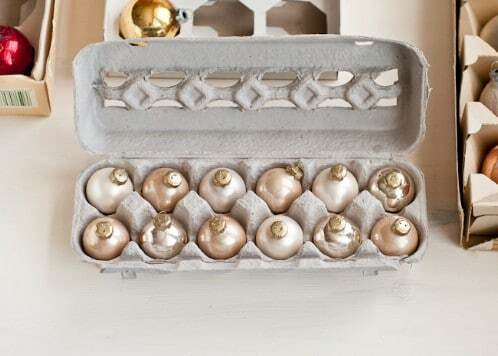 They will protect your precious ornaments just as much as they protect your eggs and they’re so cheap because you’re upcycling. Don’t you just love an innovative upcycling project? 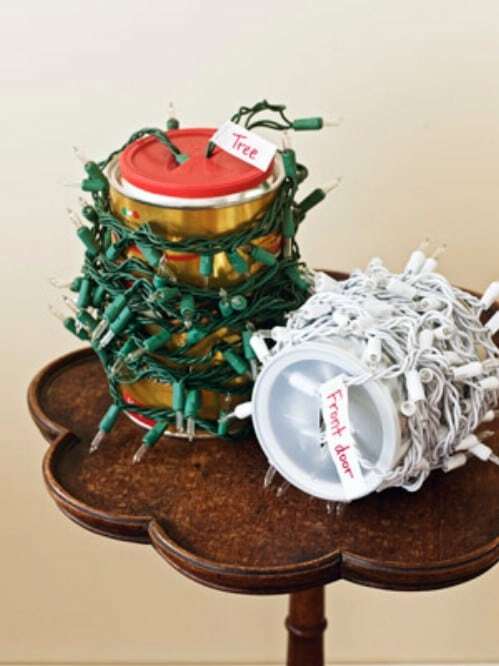 Save your coffee cans and use them to keep your Christmas lights organized. You can wrap the lights around the cans and even use them to hold the additional fuses and light bulbs that come with your light strands. You can also label the coffee cans so that you know which lights you use on the tree and which ones you use for outdoors, staircases and other décor. 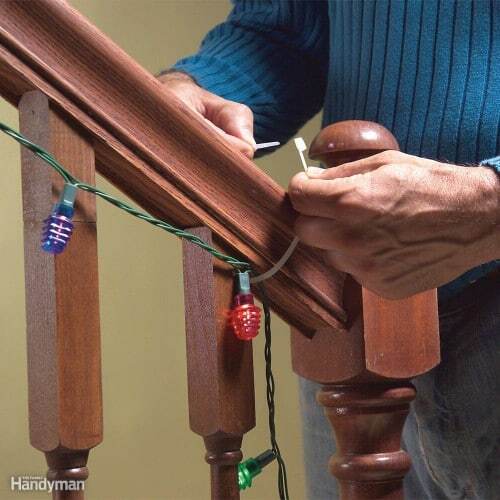 Garland and lights can be so difficult to keep up, especially on stairs and porch rails or posts. If you use zip ties, you can keep those decorations firmly in place and worry less about them being damaged when they fall. Zip ties are really inexpensive and a great way to keep your decorations organized when you hang them. 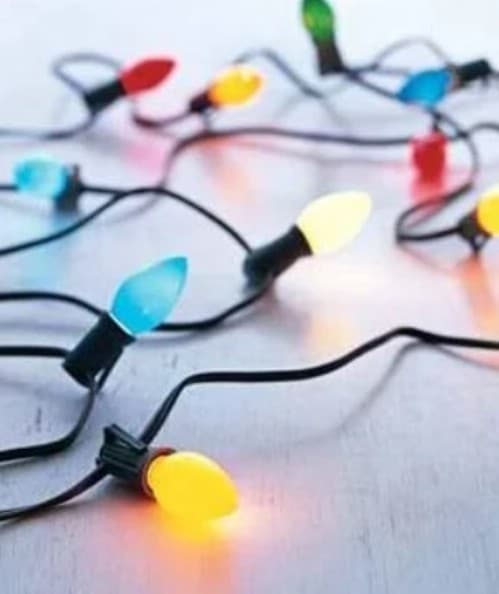 You can also use zip ties after you take them down, to keep garland and lights together and compressed so that they take up less space. Keep that wrapping paper organized and undamaged with this DIY wrapping paper rack. 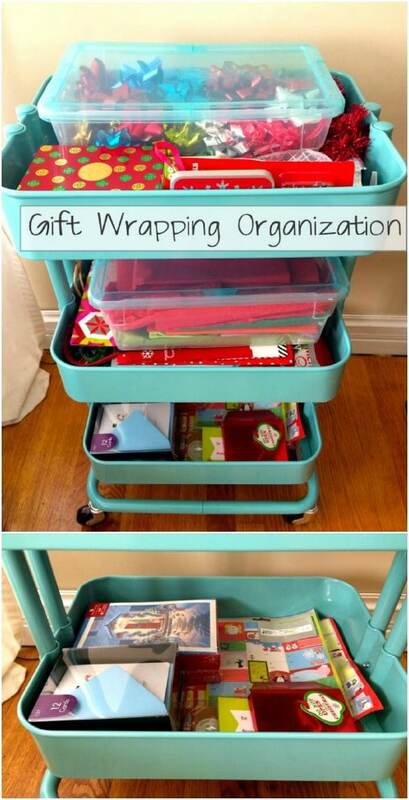 Actually, this is an excellent idea for keeping all of your wrapping paper and supplies organized. You can even hang it on the back of a closet door so that it stays out of sight and out of the way. Add wrapping paper, ribbon and all sorts of other supplies when it’s finished. Those boxes that your ornaments come in are probably good for a year or two but then tend to tear up pretty quickly. 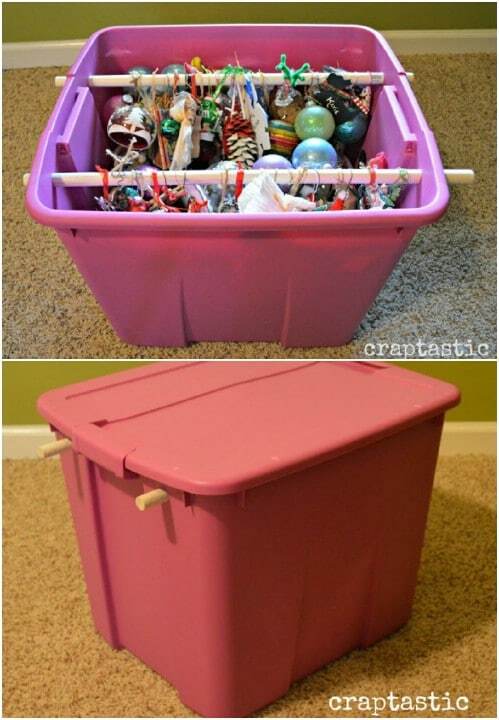 You can utilize plastic cups and a plastic bin to store your ornaments and keep them safe. 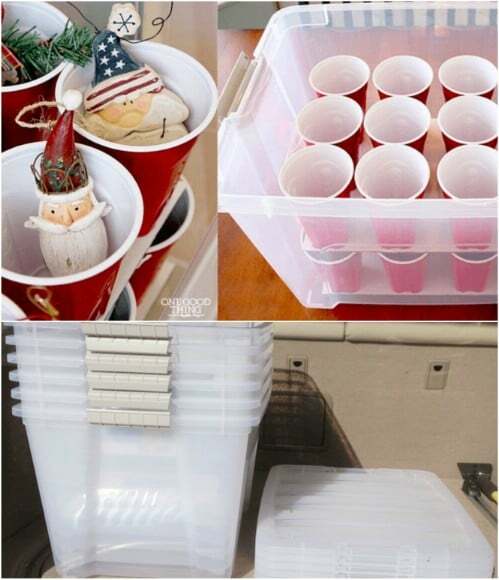 The plastic cups keep them organized and the plastic bin is much more protective than the cheap cardboard boxes that ornaments typically come in. this is a great idea for protecting vintage, antique or otherwise priceless ornaments. I love the idea of having a rollable cart for holding wrapping supplies. You can use this one all year long and especially during the holidays when you have to wrap so many gifts at once. It’s a DIY project that you make from an IKEA cart, so it’s also a hack. You know how much I love my life hacks and this one would seriously solve all of your wrapping paper and supply issues. There is literally a place for everything. This hanging storage can be made for less than $10 and it solves all of your ornament storage problems. 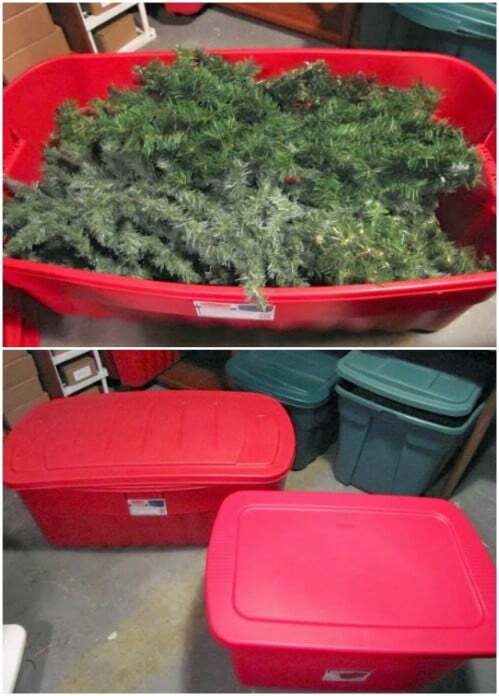 Not only will the plastic container help to protect your ornaments and other decorations, it hangs so it takes up no space at all on your floor. These are great and so easy to make. You can have several of them for different decorations – if you’re like me and have way too many things to store. 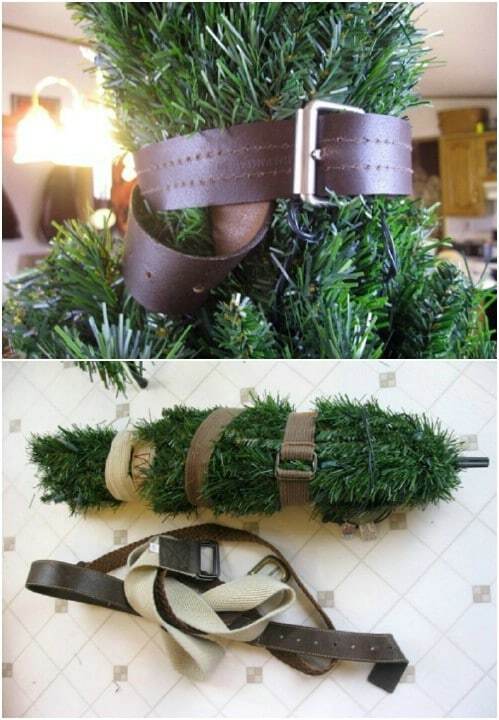 Old belts can be utilized for so many things, including helping you to put away your Christmas tree. If you have an artificial tree, you can use old leather belts to help hold those branches down so that the tree fits back into its box or any Christmas tree storage box. Just wrap the belts around the tree and then fasten them to hold branches in place and make storage so much easier. In just two hours, you can make this great DIY wrapper organizer that not only helps you to store wrapping paper but helps you to keep it organized while you are using it. You make this with an old kitchen stool, some fabric bags (that you also make yourself) and a few casters. It will roll around where you need it and when it comes time to store that wrapping paper, you simply roll it into the closet. 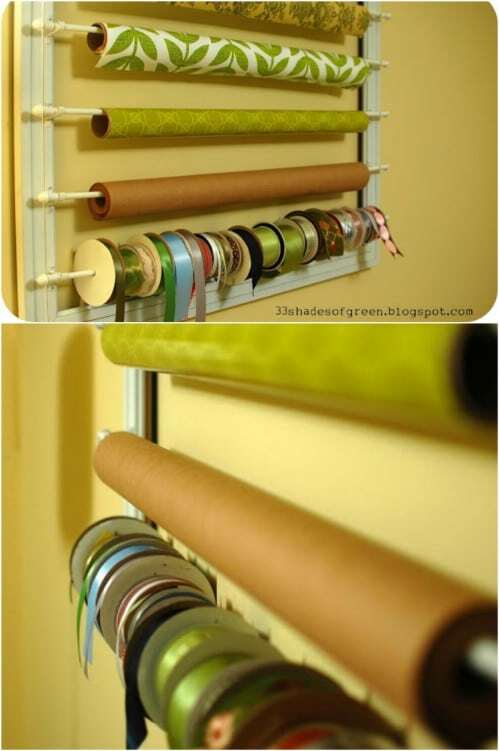 Not all of the ribbon that you’re going to use will be on rolls, so this loose ribbon storage idea is great. You can use this to store a lot of your Christmas craft supplies, too. Just find a sturdy box and keep all of your loose ribbon, yarn and other supplies and label the box so that you can keep track of what is in it. Then when it comes time to use those supplies, you’ll have them right there where you need them. Utilize the space saving savvy of an old clothing rack when storing your Christmas wreaths. Those racks will hold so many hanging wreaths, which is great if you are like me and have wreaths for other areas aside from your front door. If you have more than one wreath to store, a clothing rack is perfect. Just hang wreaths on hangers and cover them with plastic. Then place them on your clothing rack until next year.